Published in 2004, this 8½x11", hardbound book with handsome full color cover contains 160 pages and is indexed. Livingston was with Brigadier General Stand Waite at the first battle of Cabin Creek. Additionally, one of Livingston’s units of command was the First Missouri Cavalry Battalion, First Indian Brigade, also known as the “Cherokee Spikes”. From back cover: This is the story of the daring swashbuckler, Major Tom Livingston, of Jasper County, Missouri. Holding a Confederate commission, he recruited brave men and formed the First Missouri Cavalry Battalion to challenge Union occupation of Missouri. It details the saga of Livingston, his men, and the plight of Missourians in the midst of a land torn by Civil War and guerrilla warfare. 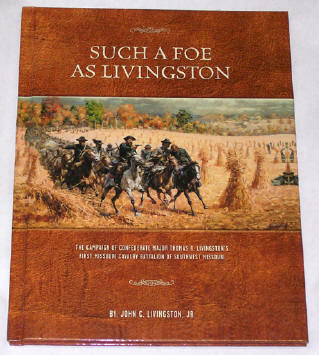 Livingston, well known and hunted by Union commanders early in the war, nearly had his rightful place in history lost as he met with the untimely death in a raid midway through the war. The book tells a story that has been waiting for many years to be told. A subject heretofore mostly unknown, it fills a serious gap in the history of the war in Missouri. About the Author: John C. Livingston Jr., the great-great-grandson of Tom Livingston, spent ten years compiling the biography. A graduate of the University of Colorado-Boulder, he lives and works in Colorado.